Shuffling through New York’s Grand Central Terminal, it’s not uncommon to see an interloping bird or two flapping about the cavernous transit hub. But on July 19, there were thousands. No, this wasn’t a Hitchcockesque horror scene; the avian exhibit was the work of some clever projection mapping design by brand experience and event tech agency Cramer. 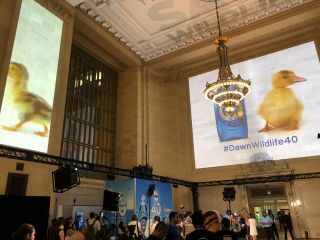 In an event celebrating Dawn dish soap’s 40 years helping to save wildlife, the company used AV to transform Grand Central’s Vanderbilt Hall into a virtual bird sanctuary. “[Dawn] wanted something really different and unique, so the idea was to transform one of the most iconic spaces into New York into this amazing natural, wild place—a wildlife preserve, if you will—and give people the chance to feel what it’s like,” said Steve Johnson, SVP of creative services at Cramer. This was accomplished using 16 Barco UDX-4K32 31,000-lumen 4K projectors for a total of some 480,000 lumens. “We’re doing four columns here, we’re doing the center back wall, and we’re also doing the entire roof and back wall all the way to the main causeway that opens up into Grand Central,” Johnson said. According to Johnson, the mapping design for this space wasn’t easy, as the walls and ceiling feature ornamental architectural appointments and there are chandeliers suspended within the room. So he and his team turned to Disguise technology to make a rendering of the room and create the projection show. “We came in mid-June to map the space,” Johnson said. “With a laser scanner, we take a scan of the space. We recreate that entire model in 3D, and then we take that model, pick one of the vantage points, and then start to be able to map the space. “We do that all through the Disguise software using Macs. That allows us to be able to shift and warp, and keystone the projectors so that we’re able to accurately map them onto the space. So we build it back at our studios in Boston using that 3D model, getting the exact projections by setting cameras where the projectors are, and that allows us to get things together much more quickly.” And speedy setup was a must for this exhibition, as the team had less than 36 hours from load-in until show time. The presentation also incorporated spatial audio to enhance the sense of immersion. According to Johnson, the show utilized four channels of surround sound emanating from Electro-Voice speakers mounted to the trusses, and was done using Pro Tools software. “So if you’re back here against this column, you’ll hear when the ducks go up… flapping as they take off,” Johnson said. To watch a video of the mapping show, click here.